RePub, Erasmus University Repository: A Case of Mixed Motives? A Case of Mixed Motives? In most EU countries and the United States, immigration detention is deﬁned as an administrative, non-punitive measure to facilitate expulsion. 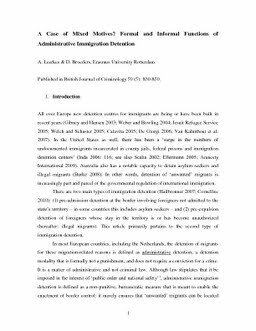 This paper argues that immigration detention in the Netherlands serves three informal functions in addition to its formal function as an instrument of expulsion: (1) deterring illegal residence, (2) controlling pauperism and (3) managing popular anxiety by symbolically asserting state control. These informal functions indicate that society has not found a deﬁnitive solution for the presence of migrants who are not admitted but are also difﬁcult to expel. The analysis, which is placed against the background of the functions of penal detention, is based on policy documents, survey data, administrative data and ﬁeldwork in a Dutch immigration detention centre.